Alex is for sure out little fish. She loves to be around and in water. 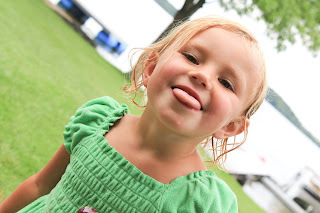 It can be the sprinkler, a pool, just a hose, water table or the lake. She loves water. She has truly impressed us this year with how far she has come and how brave she is. 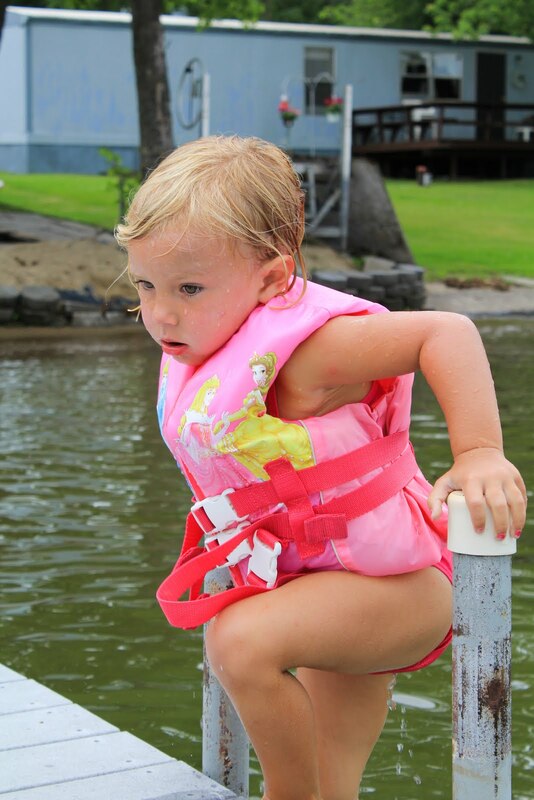 Even after falling into the water without her life jacket on, hanging onto the edge of the dock and while Chad and the lake neighbor Dean went racing after her she still has no fear. Yeah she cried a little bit but that great thing is her head never went under, she managed to get to the side of the dock and hold on and yell for help. Yes it was scary, I had no idea what was going on until Chad took off running. But she was ok and it didn't make her afraid of the water one bit. I have a few videos that I want to show of her. She has been in swimming lessons once with me and she will be in them again in August. At the lessons this year I won't be in the water with her. It is 0 level entry so it will be her with other students and a teacher or two. We don't take a lot of videos but Chad was so proud of her and I want to make sure I document these. I know she has a life jacket on but last year she would barley even wear a life jacket. She is only 3 years old and it is so important for a child to be comfortable with water. 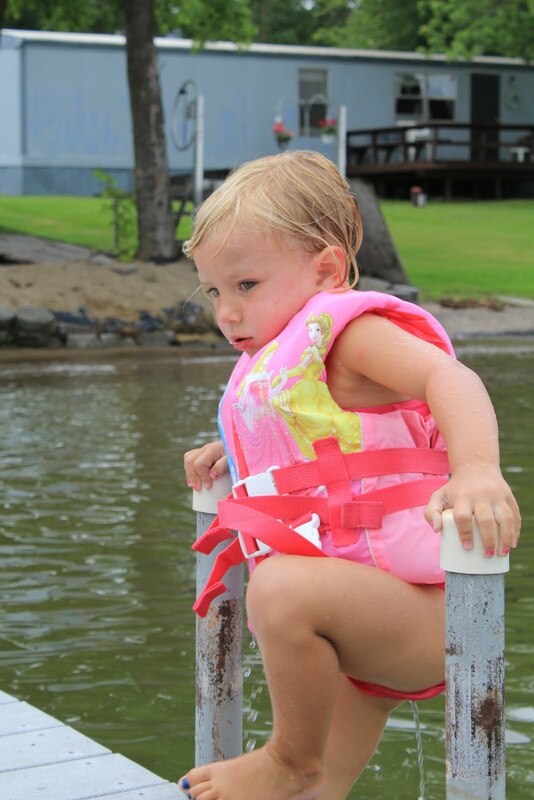 She also loves to bounce back and forth between Eric and Chad without her life jacket on. She was playing with Katie and Leah as well. She is just so brave and seriously has no fear. Sometimes it worries me but most the time it just makes me proud and I hope she is always a dare devil and fearless but with good judgment. Here are just a few pictures of Alex being Crazy with a Sucker. She has way to much energy sometimes. She does and says the funniest things. Moments with her are priceless and soo worth it! She spent the entire week at the lake with Grandma and Grandpa. She absolutely loved it but was ready to come home by the end of the week. I swear she got taller, smarter, tanner and blonder by the time the week was over. I know grandma and grandpa loved having her there for the entire week. 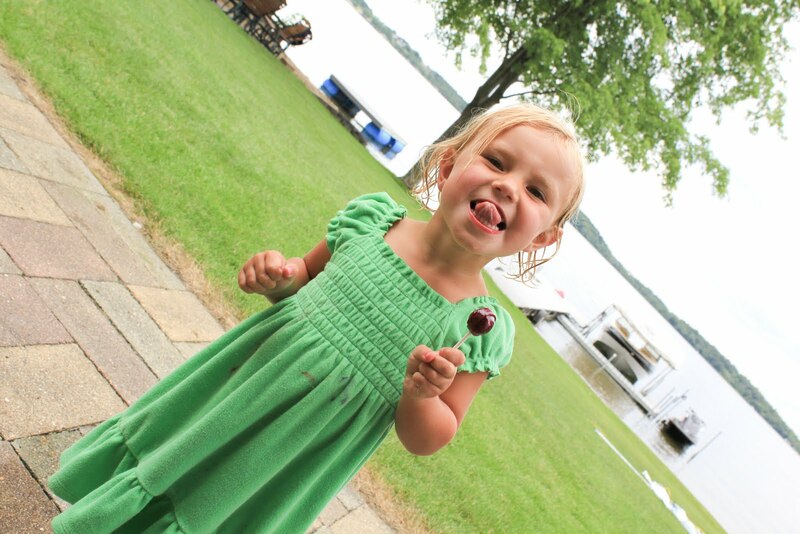 Maybe again this summer she will be able to enjoy some extra one on one time with grandma and grandpa. that is so great that she is all ready so comfortable in the water--cute video too! that's so awesome! i completely agree about them being comfortable in the water. once again she is so beautiful!! That is great that she's so comfortable in the water! Allie is like that too. Love her life jacket - it's awesome she's so comfortable! I hate that flash player is messed up bc I can't watch the videos- makes me sooo mad! Where did you get her dress - it's adorable! Love it! She is a little fishy! She is such a doll. 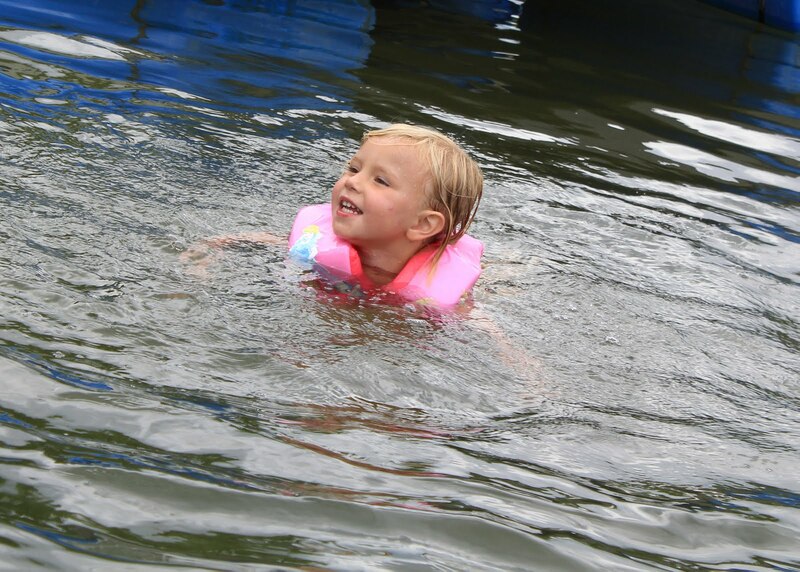 I am so glad she is enjoying the water this summer. Lillian has been really afraid of the water this year. It made me really sad especially when I thought about previous years where we had so much fun in the water. Hopefully next year she will feel more comfortable again! Thomas has juice mixed with water in a bottle usually 3 or 4 ounces once in the morning and once in the afternoon. Sometimes we get busy and miss one of those, but that is what I try to do. In between a few hours until the next feeding. That's great she's so comfortable in the water. Aidyn has just started to become more confident with swimming but he freaks out if water gets on his face. Swim lessons are definitely in our near future! What a little swimmer! She is so adorable, and I love that green dress! I just saw this post. So cute. Check her out swimming so good.